No more rushing back to your desk to answer calls. The Plantronics APS-11 Electronic Hook Switch (EHS) module enables wireless headset users to place or receive calls without the need to lift the handset of your Siemens & Aastra phones. Freedom to move away from your Seimens phone and answer calls from wherever you are, simply with a press of your wireless headset call control button. The Plantronics APS-11 EHS only works with the following Plantronics wireless headsets: CS510, CS520, CS530, CS540, all Savi 700 series, Voyager Legend CS, MDA 200, Savi WO300 & Savi WO350. Use the APS-1 for earlier model headsets. 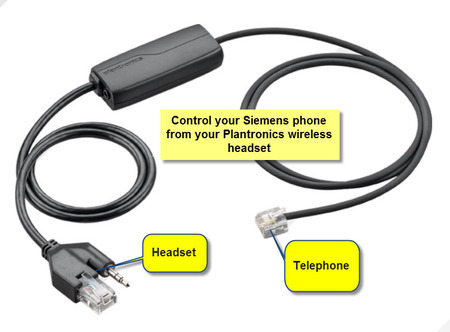 Direct connection to your Siemens phone, which eliminates the need for a mechanical handset lifter device. This product supercedes the APS-10 Electronic Hook Switch.